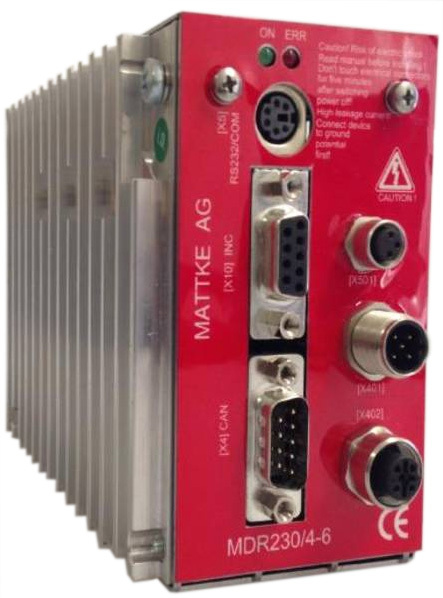 Mattke (Germany) offers the MDR230/4-6S digital servo amplifier. The product features a CANopen interface. The digital amplifier was refined according to customer's requirements. It is able to solve applications without further controls. The amplifier supports 4Q-operation and constant transfer, torque, speed, or position control with short cycle times. It provides CANopen and EIA-232 communication. The CANopen interface complies with the CiA 402 profile. The maximum CAN bit-rate is 1 Mbit/s. For the parameterization the supplier offers a software package. Additionally, 64 storable positions, and an integrated positioning program with up to 32 positions are also available. The product measures 195 mm x 102 mm x 65 mm and is IP20-rated in the mounted state. Its logic power supply is 24 VDC. Its mains supply is 230 VAC.